Thread: The World Collage Proect: Can you draw a rabbit? The Rabbit World Collage is a crowd funding project under the theme "Rabbit"
As a devotion to all the bunny lovers. 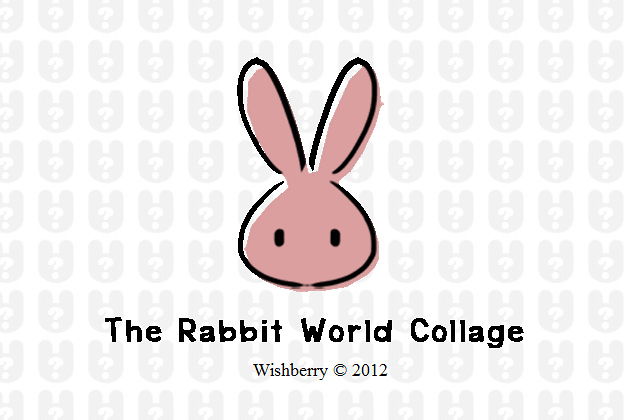 We want to make the collage out of the massive artworks & doodles of rabbit from people around the world. With a space of 50 x 50 pixels, you have a freedom to express any idea under the keyword "Rabbit". Doodle, Photography, Pixel art, Typography, CG. There's no limit for your rabbit. Please check this link for more detail. Your support is very appreciated. Wait what? So... do I have to pay to get a scribble a 50x50 pixel bunny? The link doesn't tell anything where one should send the pic if they don't want to pay for the name under it, so I'm assuming you have to pay 1$ to get your rabbit in there. Also what's the difference between "ULTRA High Resolution" and... not ultra high resolution? Unless you're planning on making the 50x50 images even smaller for the website for no reason. Last edited by TinyBird; April 5th, 2012 at 04:55 AM. It's the term of size. The web version is limited by the display resolution. If we really got a lot of artworks, they might be shown in cycle. That's why the Ultra version which contains all the images can be a lot larger. Where will your support go to? 2. We want to start the pre-production of the new animated short called "Rabbit Collage", a story of our tiny cute fluffy friends. Like, wouldn't it be easier to get the IndieGoGo funding going to that animation, but keep the bunny collage free and use it as a way to drum more business and knowledge about the animation, and keep donations optional? I mean, you could easily do something similar like that collage in DA or anywhere for free (and I have seen several collage images been done there) so having to pay for something that's obvious (credit/space) just seems really off-putting to an otherwise cute project. Thanks again for the comments. I'll improve and make it all worth.